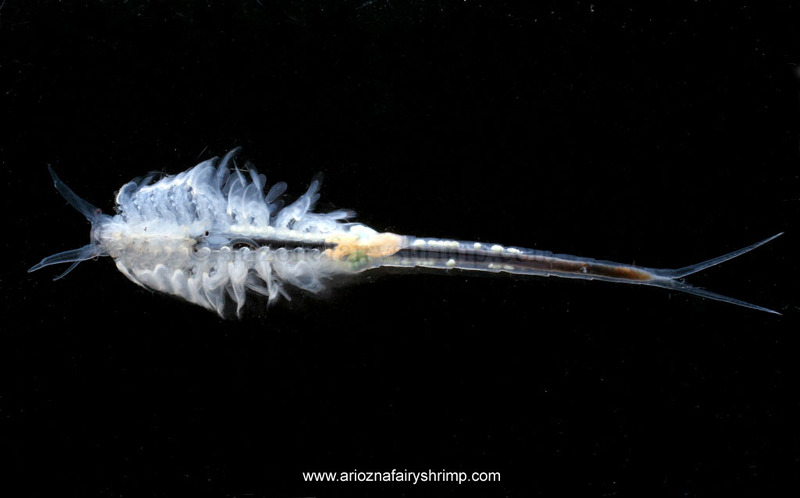 Branchinecta gigas is the largest fairy shrimp in the world. We have raised them as long as 80 mm (3.1 inches without measuring furcate tail) in our lab, but they grow up to 180 mm (7.1 inches) in the wild according to a record. 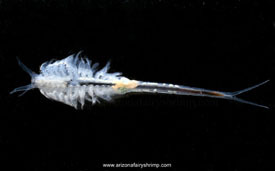 They have wide legs to catch smaller fairy shrimps, but have slimmer body compared to other fairy shrimps. Also, they have furcate tail like Triops which takes about 15% of the total body length; besides above facts, just like other fairy shrimps they have male and female, 11 pairs of legs (total of 22), two red-brown eyes, and swim upside down. Male gigas has larger front antennas than female gigas; however, the antenna to the body length ratio is smaller than other male shrimps in brachinecta family. Oppositely, females have longer antennas than other female shrimps in brachinecta family. The dry eggs start hatching between 24~48 hours when the water temperature meets their condition. Otherwise, they wait until the water temperature changes. In the wild, usually when rain and snow fill up dry lakes (Playa), the water is colder than the hatchable temperature, and they wait until the Spring and the weather gets warmer. The best hatching temperature range is 45°~60°F (7°~15°C) and the same for the living of mature gigas. 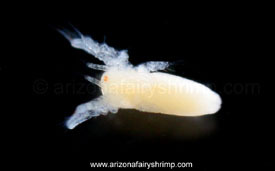 They can hatch and live in the water containing little higher level of salt than other fairy shrimps, however, the hatching and survival rate descreses as the salinity percentage increases. They grow slower, too, in salty water. The just hatched out larva is about 1mm, and grows bigger 2 to 3 times everyday. They are ready to hunt other smaller fairy shrimps from the hatching, even each other; but usually they start hunting after reach 3 mm. If the water temperature stays in the higher range, they grow up faster, but the potential maximum size becomes smaller. They begin laying eggs after 18 days from the hatching in the best condition, but normally 30 days. When they start reproducing, they are about 40~50 mm in cold water and 30~40 mm in warm water. And the average size of females are about 10% larger than males. Their average lifespan is 8 week. 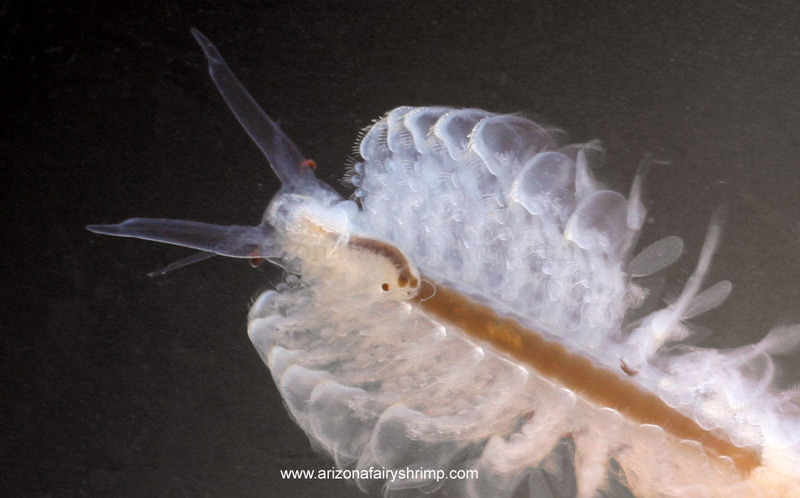 A single gigas eats as many as 200 fairy shrimps everyday, specially when they are young. 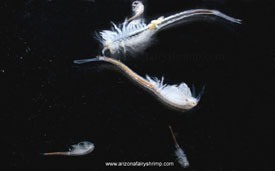 They catch smaller fairy shrimps with their wide legs while swimming. When they are starving, they bend their body and make 'V' shape and swim circle around until catch a fairy shrimp. This movement looks funny, but it is their skill to catch fairy shrimps easier, works like a trap. 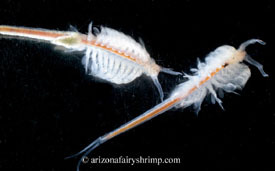 When a fairy shrimp swims into the gigas's tail side, the fairy shrimp automatically runs to other direction by its habit, which is jumping directly into the trap of gigas. The chance is not high, but better than trying to catch one while swimming straight. Watch below video to see how they swim like. Another interesting fact is gigas does not hunts extremely smaller fairy shrimp than gigas itself. For an example, 15 mm long gigas eats larger than 2 mm size fairy shrimp, but discards the shrimps smaller than 2 mm after catching them.